Following the just-announced news that directors Phil Lord and Chirs Miller will direct a Han Solo spin-off movie, Birth.Movies.Death reports that none other than Darth Vader will appear in the first solo “Star Wars” movie, Star Wars Anthology: Rogue One. 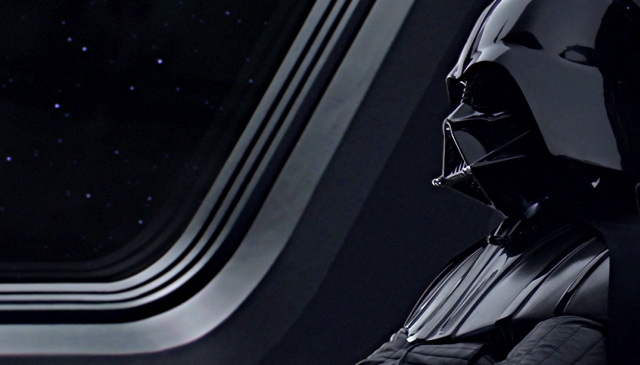 The site reveals that Vader will not be the primary antagonist of the film but will be “behind the scenes, pulling strings” and will literally appear onscreen via a viewscreen or holo projection. The first in the “Star Wars Anthology” series of spin-off films, Rogue One will follow a rogue band of resistance fighters united to steal the Death Star plans and bring new hope to the galaxy. “It’s the reality of war. Good guys are bad. Bad guys are good,” director Gareth Edwards said at Star Wars Celebration. John Knoll, the Academy Award-winning visual effects supervisor who currently serves as chief creative officer at Industrial Light & Magic, is executive producing the film along with Simon Emanuel (The Dark Knight Rises, Fast & Furious 6) and Jason McGatlin (Tintin, War of the Worlds). Kathleen Kennedy and Tony To (“Band of Brothers,” “The Pacific”) are on board to produce with John Swartz (Star Wars: The Force Awakens) attached to co-produce. It was also recently confirmed that Alexandre Desplat (The Grand Budapest Hotel, The King’s Speech) will be providing the score. Starring Felicity Jones as a rebel soldier along with Riz Ahmed (Nightcrawler), Sam Claflin (Snow White and the Huntsman), Diego Luna and Ben Mendelsohn (The Dark Knight Rises), Star Wars Anthology: Rogue One is set for release on December 16, 2016.